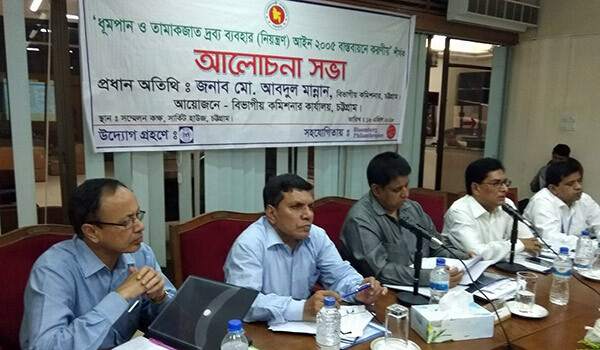 Shankar Ranjan Saha, Additional Divisional Commissioner (General) of Chittagong division declared in a speech that tobacco control issue would be included in monthly coordination meeting’s agenda, while he was present as chief guest in a discussion meeting on “Implementation of Tobacco control Law in Chittagong Division” held on 16 April 2018 at the auditorium hall of Chittagong Circuit House. The meeting was organized by Chittagong Divisional Commissioner Office, initiated by YPSA and supported by Campaign for Tobacco Free Kids. Mr. Mostafizur Rahman, Additional Secretary, Cabinet Division was present as honorable guest in the meeting. The chief guest Shankar Ranjan Saha also advised all DCs to assign a Focal Point Officer in each district, prepare an action plan, include TC initiatives in their program schedule and include TC issue in the UDCC and DDCC meeting as agenda. The honorable guest Mostafizur Rahman, Additional Secretary shared tobacco control law and provided some directions to enforce the TC law at district and divisional level. He also said that everybody should play their responsibility from their own positions. They should take initiatives to activate all Sanitary Inspectors, arrange campaign and solidarity events at school level and consider the TC initiative as a public health support program. He added. Additional Divisional Commissioners, Director of Local Government department, Chittagong Division, 11 Deputy Commissioners (DC) of eleven districts, other government officials and ATMA representatives participated in the meeting. Dr. Mahfuzur Rahman Bhuiyan, Grant Manager, CTFK attended the meeting as guest. Md. Mahabubur Rahman, Director (Social Development) of YPSA delivered the welcome speech. Ms. Nasim Banu, Team Leader, Tobacco Control project, YPSA has presented the initiatives of tobacco control in 11 districts, violation of Tobacco control Law and some measures for effective implementation of Tobacco control law.